Missing teeth not only negatively impact self-esteem but can also affect your ability to speak and eat. Tooth loss is common after severe decay or trauma, but options are available to effectively replace missing or extracted teeth. Dental Professionals of Jersey City provides dental implants provided as a comprehensive tooth replacement solution to restore function and aesthetics. Dr. Paul Lustiger offers this treatment to rejuvenate patients’ smiles and greatly improve their confidence. Implant-supported restorations replace the entirety of a tooth from root to crown. Implants also maintain the strength of your jawbone. 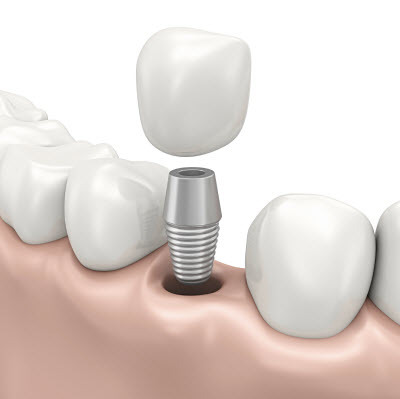 The dental implant post is surgically placed into the bone, providing superior support for the tooth replacement. The implant post acts as a tooth root and keeps surrounding teeth from shifting, which preserves dental alignment and keeps your smile in its best health. With the foundation created by dental implants, bite strength is fully restored. Patients do not have to shy away from eating their favorite foods. Our capable staff makes your comfort our first priority. Before beginning implant treatment at our Jersey City facility, we go into thorough details of obtaining implant-supported restorations. By providing you with all the necessary information regarding placement and completion of implant treatment, we support your confidence and peace of mind. After performing a thorough examination of your smile, Dr. Lustiger determines if you meet the requirements to proceed with receiving dental implants. If your dental or gingival structures ate not healthy enough to support best results, pre-treatment must be administered before continuing forward. Our practice offers all necessary technology and services to meet your dental needs, including implant placement and tissue grafting, in one convenient location. Your restorations are fabricated by a trusted local lab that meets our standards of excellence. We provide. There are dental implant options which allow the patient to remove the prosthetic or those which can only be taken out by our dentist. Implant-supported restorations allow you to perform everyday activities with confidence. Each treatment plan we create is unique to every patient and designed to meet their dental goals. If you have any question regarding dental implants or would like to know how they would benefit your smile, call Dental Professionals of Jersey City. We help you achieve a complete and beautiful set of teeth!